Eggs benedict OMG. It is really really good, but its really, really not vegan. Hollandaise sauce is pretty dope, but its egg yolks/butter/cream. It ain’t even close to vegan. Then, it is usually topped with ham + eggs + cheese. Damn - we are striking out. Aight so let’s rethink this for a minute. Could we redo it? Well, what we create is a Southwestern version that allows us to incorporate a lot of plants and make this doable. English Muffins - The bottom layer we use vegan english muffins. Stick to the classic. 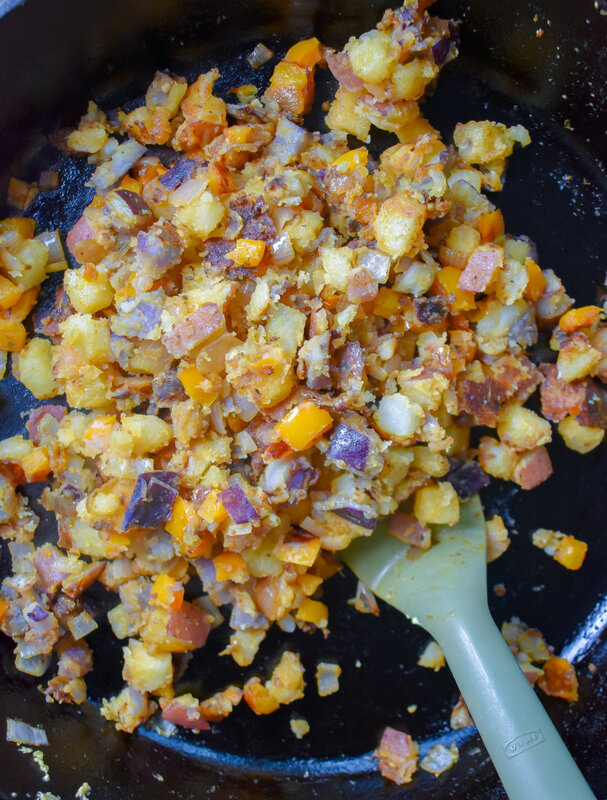 Southwestern Veggies - We saute shallots, peppers, and potatoes to create a great base. 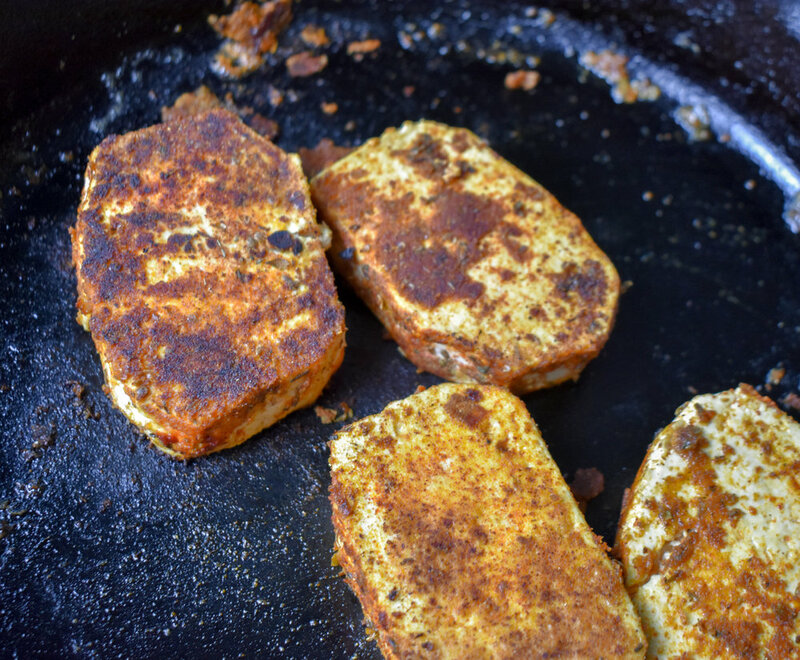 Tofu Cakes - We dry out the tofu and then dunk in milk and bread it with a delicious blend of Southwestern spices. 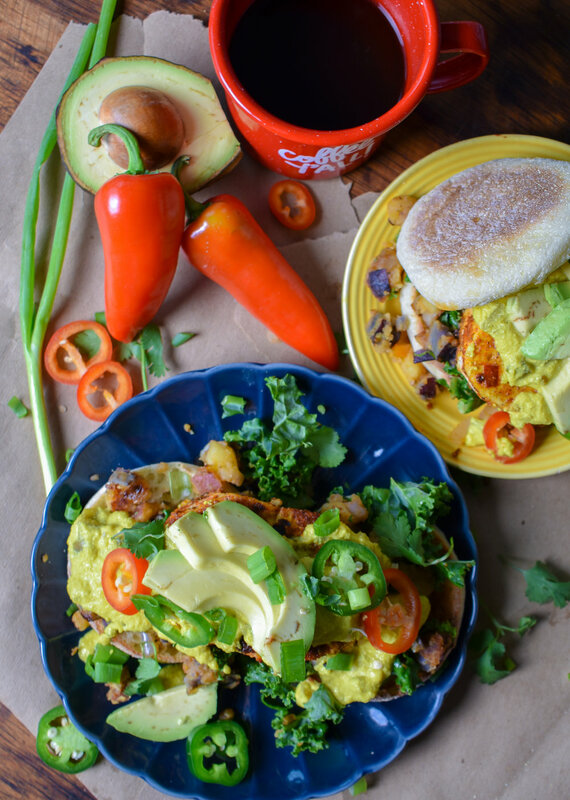 Green Chile Hollandaise - We use silken tofu, vegan butter, dairy-free milk, spices, and some tasty green chiles to make an incredible hollandaise sauce. 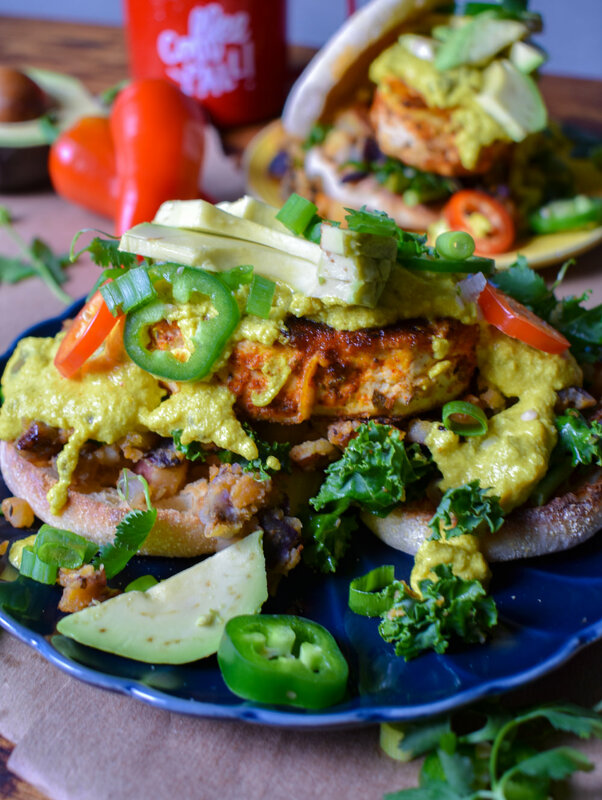 Veggies - Top it with avocado, jalapeno, and cilantro for a great finish. 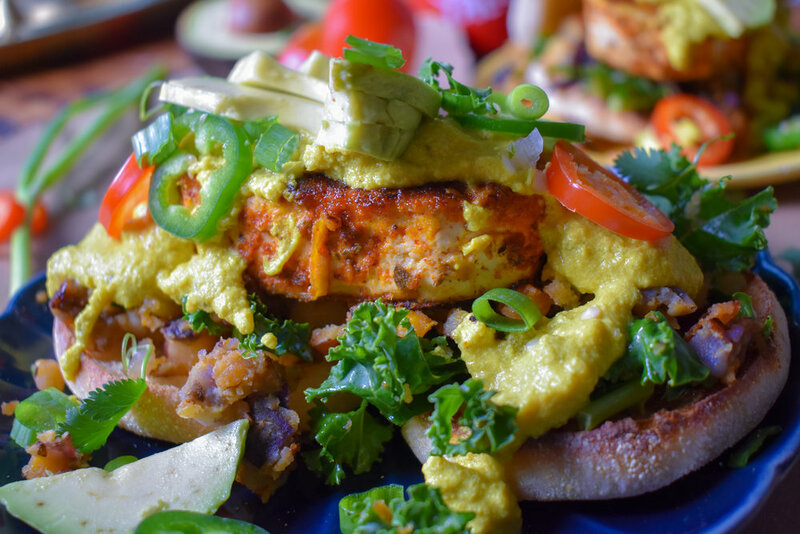 Vegan Eggs Benedict! All yours in 45 minutes. It is absolutely frikin delicious. If you ever wanted to make eggs benedict … now you can again! Enjoy homies! 1. To start, open tofu, drain, and wrap in a tea towel. 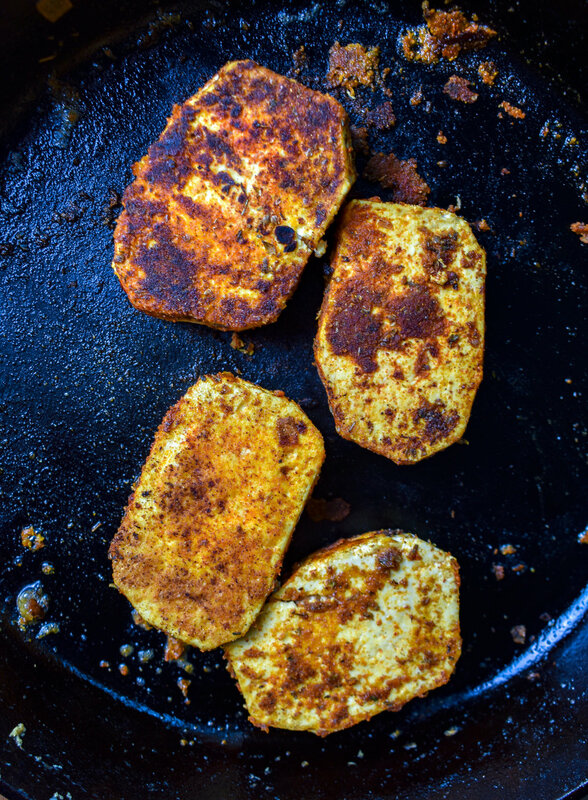 Place a castiron pan or heavy pot on the tofu to help dry it out. This will be key to make the tofu cakes. 2. Next, add the shallots, garlic, and olive oil to a large frying pan/castiron pan. Saute for 4-5 minutes then add in the peppers + spices for veggies and saute another 4-5 minutes. 3. Next, add the parboiled potatoes to the pan and turn heat to medium-high. Cook 3-4 minutes until browned and flip to the other side. Cook another 3-4 minutes and then sprinkle in the kale. Stir and take off heat. Set aside. 4. While the veggies cook, add the ingredients for hollandaise sauce to a food processor. Add tofu, milk, spices, and lemon. Process until smooth. 5. Add the hollandaise to a small sauce pot, turn heat on medium and add butter + 3 tbl green chiles. Use a whisk and stir until the butter is melted. Turn heat to a low simmer and cook until ready to use. 6. 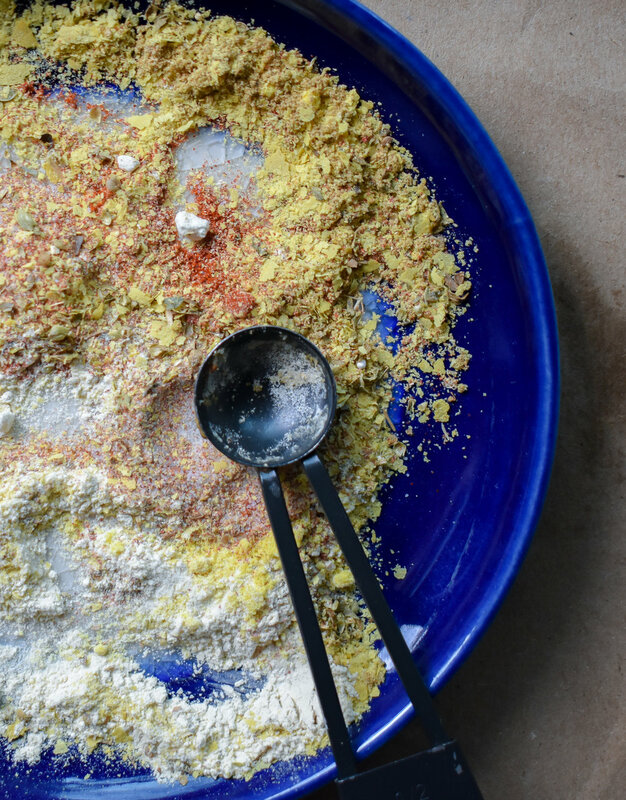 Next, add all the spices for the tofu cakes to a small plate and mix well. Pour the milk for the tofu cakes into a small shallow bowl. 7. Next, cut the tofu in half across the width and across to create four squares. I round the edges to give it some shape…but that is optional. Dunk each cake into the milk. 8. Next, place the milk-coated tofu cake onto the spice plate and coat. Repeat with each and set aside. 9. Add the cakes to a large frying pan with vegan butter and cook over medium heat for 5 minutes then flip and cook 3-4 minutes more. 10. 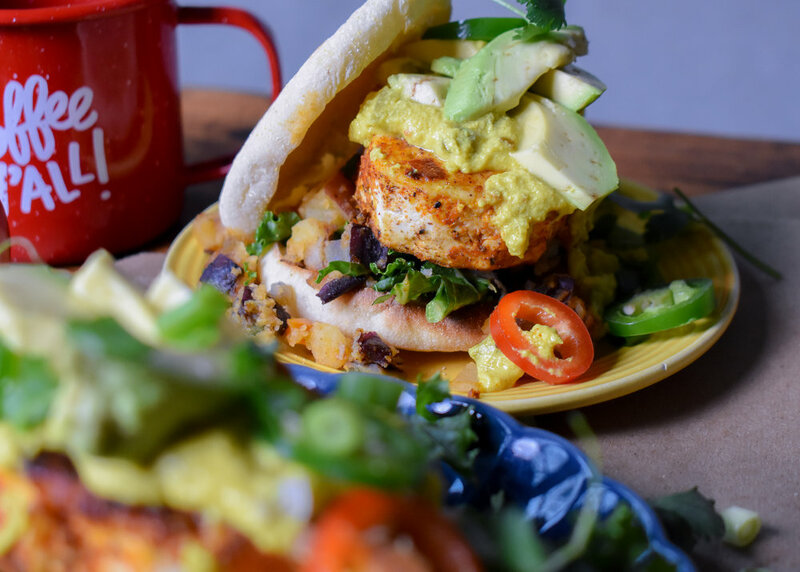 To finish, toast english muffins, add potatoes, add tofu cake, add hollandaise sauce, add 1/4 avocado, and fresh cilantro and jalapenos.